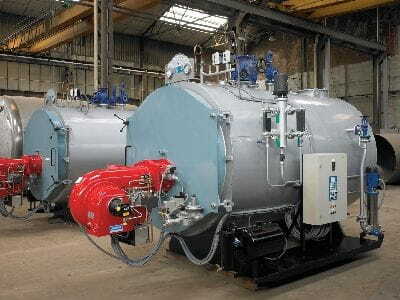 The steam generators made by Bigas Alsina, S.A. are divided into two groups, The BA-S and BA-N series. The BA-S series are pressurized generators and three smoke ways , with flame reverse. Insde it, the dart of fire is introduced into the firebox, and on his journey after reaching the end of it, goes back. This cross-flow flame ensures total combustion of the fuel particles projected by the burner. Finally, the fire, after bouncing on the frontal door of the generator, continues its way through the tubes until his departure outside. The turbulence factor affects all kids of fuel, liquid or gaseous. BA-S generators have a very favourable ratio between the production of steam and the evaporation and exchange surfaces, resulting in an optimal perfrmance and steam quality.